Butterfly Flowers, also known as Indian Paintbrush, butterfly weed, or Pleurisy root, are part of the milkweed family, Asclepias. These plants earn their nicknames through bright, clustered flowers and tendency to attract butterflies and hummingbirds. Most Popular Colors: Orange, yellow, violet, red. Soil Preferences: Loamy, well-drained soil. Many varieties prefer soil amended with sand or hummus for drainage. Climate Preferences: AButterfly flowers require a period of cold to blossom, and prefer regions with seasonal weather changes. 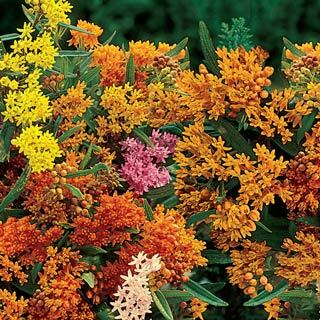 Landscaping Tips: Use these flowers to add color and bring butterflies to your yard! Monarchs are the plant’s biggest fans, but many varieties of flutterers use these plants as a food source. Butterfly plants also make great cuttings and good patio plants. Many varieties are drought-tolerant and can be placed in your garden’s drier spots. Planting: Butterfly flowers can’t compete with other surface-rooted plants, including some trees and shrubs, so don’t plant them near overpowering plants. Plant the tubers vertically, 1 inch deep, spacing 15 to 18 inches apart. Top the tubers with light soil, amending your garden soil with compost or humus if necessary. • Butterfly flowers grow quickly, with little maintenance required! • These plants prefer drier conditions, so water lightly. • Deadhead butterfly flowers after they are finished blooming to prolong blooming season. Note: Butterfly plants are poisonous to some animals, so keep out these out of the way of pets.